The University of Oregon has forged a partnership with international news organization Voice of America to provide free online training resources to English language educators worldwide. The new “Let’s Teach English” series will equip instructors with English language teaching skills and provide comprehensive tools for students. The materials for this series are based on the “Women Teaching Women English” textbook and teacher’s manual the American English Institute developed with the U.S. Embassy in Beirut to help adult women improve their English skills. The “Women Teaching Women English” materials have been used to train English educators throughout Lebanon, including in Syrian refugee camps. She suspects one of the reasons the “Women Teaching Women English” materials have been successful is because they are comprehensive and empower women in many areas beyond language acquisition. The manual weaves lessons on subjects like multiperspective thinking, critical thinking, “women at work” and “women on the move” into the reading, writing, listening and speaking components. “The comprehensive curriculum engages women beyond language learning and helps students develop critical thinking skills and build confidence,” Opp-Beckman said. The authors mapped out the curriculum through conversations with teachers and students about what topics they would want included in the text. The collaboration that produced “Women Teaching Women English” is similar to many other partnerships the American English Institute has formed with government ministries, global organizations and other universities to help enrich English learning and teaching worldwide. When Voice of America discovered “Women Teaching Women English” and heard about its success in Lebanon, it decided to partner with the UO to expand it into something that could be used with a global audience. Opp-Beckman worked closely with Voice of America to modify the manual for an international group of students while still adhering to its principles of cultural relevance. She also collaborated with the organization on instructional videos to complement the written components. A new lesson from the series will be released weekly through November, at which point the entire series will be available online. The videos use classroom simulations to help instructors hone their teaching skills. 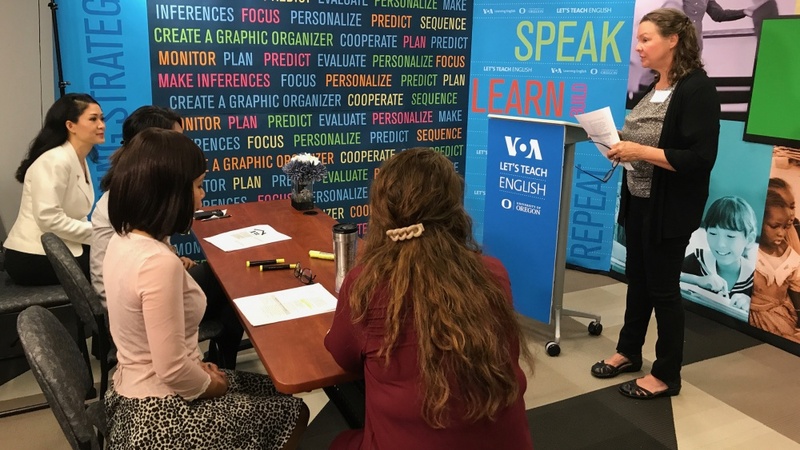 “The University of Oregon team ensured the quality of the final product by sharing their expertise in language teaching as well as collaborating on both the teacher and student materials,” said Jill Robbins, a linguist on the Voice of America team who helped design the video series.